Hallo iedereen!! * Hallo everyone!! If I purchase stamps I usually try to think how I can use before I actually buy them. 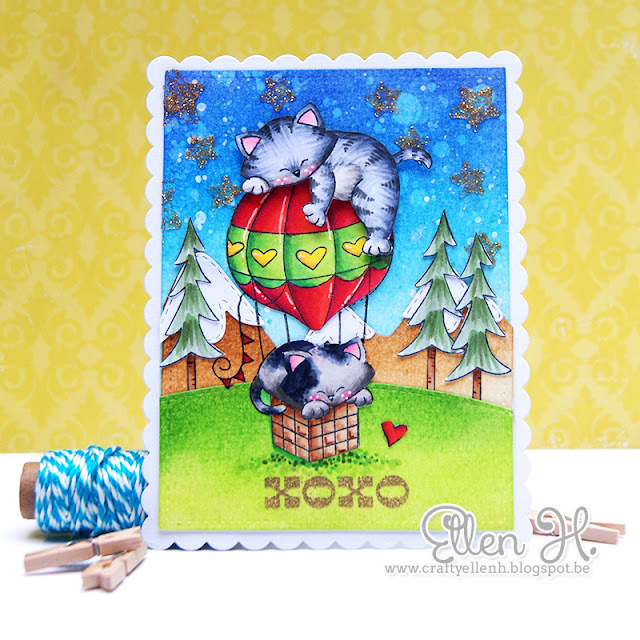 When I finally got my new stamps, I had to use this course for this blog post on Copic Marker Benelux; I wanted to put the cat (which is normally on a ball of wool) definitely on the balloon. * Als ik stempels aankoop probeer ik meestal na te denken hoe ik die kan gebruikten alvorens ze echt te kopen. 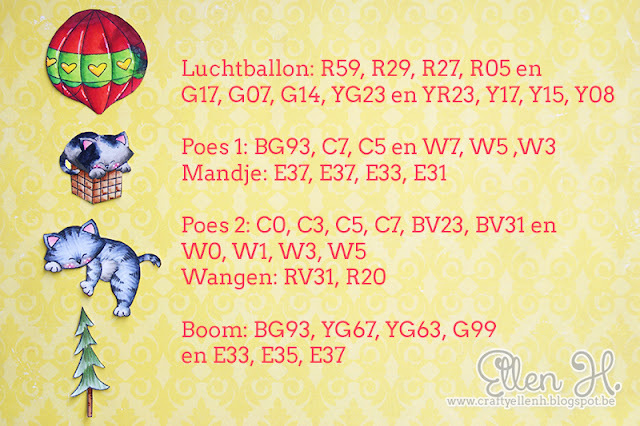 Toen ik eindelijk mijn stempels toe kreeg, moest ik deze natuurlijk gebruiken voor deze post voor Copic Marker Benelux; ik wil de poes 2 (die normaal op een bol wol hangt) absoluut op de luchtballon plaatsen. After I had colored all stamps with my Copic's, I made a background with several dies, distress ink, texture paste and glitter. On the last step I used gold embossing powder for the "xoxo". * Nadat ik alle stempels met mijn Copic's had ingekleurd maakte ik een achtergrond met enkele snijmallen, distress inkt, texture paste en glitter. Als laatste stap gebruikte ik goud reliëfpoeder voor de "xoxo". Sunday I have a nice tutorial for you ready; hopefully you come peeping on my blog! 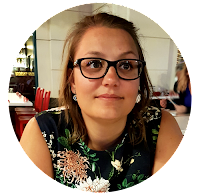 * Zondag heb ik een leuke tutorial voor je klaarstaan; hopelijk kom je dan nog eens terug piepen op de blog. This is just a beautiful card and i like everything about it. Color and cat- love it! This card is stunning! I am amazed at how skilled you are at using those Copics! At first glance, I thought this image had come printed in color because it looks so professional! You have a great way of adding texture and depth with your coloring and it really brings these images to life. Great technique on the sky, too! Love those splatters! Thanks for sharing such a delightful card with us for this week's Simon Says Stamp Monday Challenge!